Loosduinen is and has always been green, from the days when it was a small market garden village of vegetable fields dotted with hothouses to its present-day status as a Hague suburb. Loosduinen is centred around a modern square that has replaced the smaller village centre. The town is quite urbanized now—it has a mall near the square. And its proximity to the sea brings a lot of tourists. Yet many of Loosduinen’s attractions hark back to earlier times. Inside Loosduinen's church is a monument to a strange legend. In 1276, or so it is said, a countess insulted a beggar woman who had twins, insinuating that the children had different fathers. God punished her by making her bear 365 children on Good Friday. A wooden memorial tablet referring to this legend was already famous in the 17th century, when the English diarist Samuel Pepys visited, and can be seen to this day. Modern Loosduinen takes pride in the decline in the local crime rate in recent years and the town’s positive socioeconomic statistics (relatively high incomes and low unemployment rate). Bohemia/Lake and Forest has many houses rebuilt from the ruins of houses destroyed during World War II, including fine examples of Art Deco, New Objectivity, and the International Style. It has swaths of wooded areas, as well as a commercial hub with a shopping mall and an office tower. 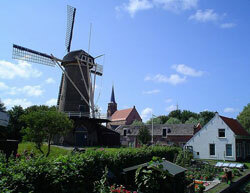 Kijkduin/Ockenburgh, close to the sea, has recreational areas, parks ideal for caravans, and a small shopping centre. Its apartments and private homes are popular with well-to-do city residents who enjoy the sea air and a less bustling pace of life. The Kraayenstein/Uithof district is where Loosduinen’s church is located. High-rise flats are common in this area, which is popular with younger people. The Loodsuinen/Houtwijk centre is relatively new, with a large, diverse population. In the past Houtwijk had several factories, but in time the companies left. In the 1970s the Loosduinen government started redeveloping the area. Today families are attracted to the neighbourhood's single-family homes, and enjoy its proximity to the city centre, the bicycle-friendly atmosphere, and many green spaces. Houtwijk’s residential area is further divided into eight parts: the Architects’ area (mainly middle-class residents; houses dating from the 1980s; with a park), the Mayor’s neighbourhood (which has the oldest houses in Houtwijk), the Historians’ area (middle class, mixed population), the Human Rights area (mid- and lower-income residents; many terraced houses with narrow gardens), the Artists’ area (middle class; with a shopping centre), the Board area (privately-owned homes; with canals and parks), the Verzetsheld (higher-income housing; includes houses and apartments) and the Vredestein (which consists of only two streets, with large houses). In Waldeck/Tuinenbuurt en Noitenbuurt, pre-war homes combine with new retirement flats to accommodate the high percentage of elderly residents.